A new workplace aims to attract a creative workforce and inspire innovation. A company in Reading, England charged AIS to create its new future-focused workplace in Reading’s Thames Tower. It wanted the office to appeal to a creative workforce, while also encouraging innovation through interaction and leveraging the latest technology for communication, presentation and collaboration. With an agenda to create a smart casual environment to appeal to creative types, AIS went about designing a space that was youthful and contemporary while also appearing sophisticated and forward thinking in tune with the company’s entrepreneurial nature. Image courtesy of AIS. We set up all the fixed desks into “neighborhoods” and placed them around the space according to the adjacencies of departments within the business. For instance, the sales team were located near the “louder” section of the office next to the breakout space and were given a desk sharing ratio of 0.8 desks per person to accommodate for the time spent out of the office on any given day. Our client was keen to ensure there wasn’t a hierarchical culture within the work environment, so we made the decision not to include any private offices, instead to allow access for any employee to use a phone booth, focus room or hot desk space. Each space had carefully considered partitioning solutions that separated teams acoustically but maintained a sense of the “one office.” Image courtesy of AIS. We introduced a mixture of formal and informal meeting spaces, through different use of furniture and fixed components. The final design had a total of 4 fully enclosed meeting rooms ranging from a 14-person boardroom to a 4-person Interview Room. We supplemented these spaces with a number of different informal meeting/collaboration spaces, such as a standing Think Tank space, a high bench media unit and a large collaborative hot desking space with bench seating. Along with the variety of meeting spaces and designated working areas, we designed a breakout space that was a key feature of the project. This was divided into two sections. A collaboration space and the tea point/socializing space. Included in the collaboration space were long bench seating, upholstered chairs and a ‘plug and play’ approach with the power and data to allowing for instant working. This space was to be used by staff members visiting from other areas of the country or for touchdown meetings and laptop work by resident members of staff. The tea point/socializing space was designed to be flexible, with a moveable tiered seating unit, stackable chairs and fliptop tables. The tea point was fully equipped to service a large event as well as the day to day requirements from the staff. Adjacent to this space, and around the core area we included a furniture store room, cleaners room, print station, comms room and IT room. These were discreetly hidden away and located in positions depending on the use and the existing services within the building. Across the floor plate, the design of the space aims at fully embracing the company culture of openness. Image courtesy of AIS. The project was completed in the newly refurbished Thames Tower in Reading, located opposite to reading train station and within walking distance of Readings main town center. We had an extensive set of employers’ requirements given to us at the start of the project and as a result didn’t need to do our own pre-planning questionnaires. As the design progressed, we held staff engagement workshops to answer any concerns or questions from the staff. This was a great opportunity to get the staff excited about their move and the new office. In order to hit the move in date set by our client and their budget, we had to ensure our design was efficient and logical, without jeopardizing the overall look and feel and function of the space. We took careful consideration when looking at the existing mechanical layout and used this to inform the design. Along with the variety of meeting spaces and designated working areas, AIS designed a breakout space that serves as a tea point and a socializing area. Image courtesy of AIS. To ensure flexibility and future-proofing, we used acoustic bricks as a space divider. They are moveable and can be relocated once they reach capacity. Connection-Platforms unit. This was the moveable tiered seating elements used within the breakout space, and has had a great reception from all staff members. We used the brand color in small details throughout the design and included wall graphics of some of their most striking imagery. The central breakout space is the most unique feature of the new space. It is a comfortable and welcoming space day to day and yet when opened up into the event space it accommodates for townhall meetings and staff events without feeling cramped. The new office contains 4 fully enclosed meeting rooms ranging from a 14-person boardroom to a 4-person Interview Room. Image courtesy of AIS. We introduced a bespoke living wall to the entrance/ welcome space with its own irrigation system and lighting. 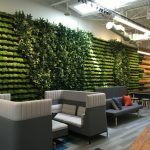 This has a striking impact as you enter the space, and this feeling has been carried through the space with units full of planting, hanging plants and natural materials. All of the desks are electronic sit-stand desks which promote wellness and allow the staff choice on how they work. We recessed a 4 Screen AV wall into the entrance space which was linked to the IT room and could be changed to show anything they needed. The breakout space had an individual circuit of ceiling mounted speakers and lighting so this space could be controlled as a stand-alone space. The client own Smart TV’s were used (90” screens) in the meeting rooms, which we detailed to be recessed into the partitions. The physical relocation of the office was the most difficult aspect of the project. The staff engagement workshops and site visits helped to alleviate some of the doubt, however that was always an underlying issue with some staff on their new commute to work. One of the main goals of the design was to create a space that was bold and engaging in order to fulfil the clients’ commitment to making the organization a great place to work. Image courtesy of AIS.